I’ve used whites, soft neutrals, greys, and silver and I love the way it turned out! 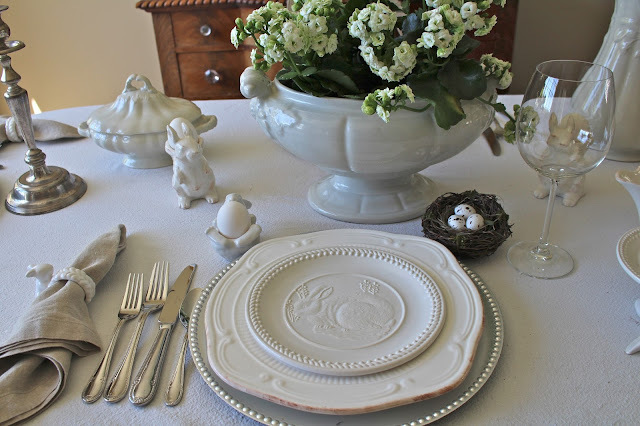 I’m not sure if I will use this for our actual Easter brunch (I may go with the more traditional pastels for that) but I do love the change of pace! 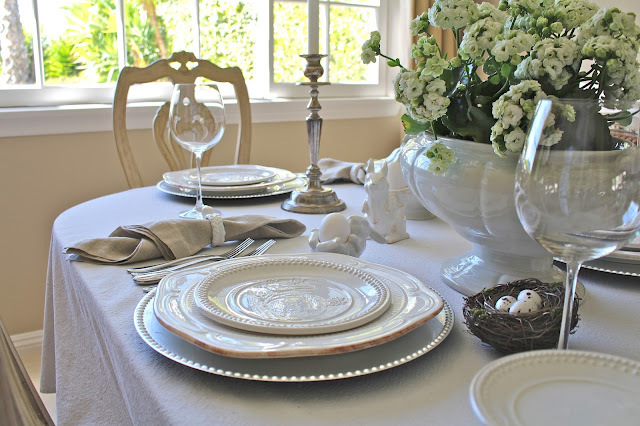 And if you’re looking for more table setting inspiration, be sure to check out my free e-book featuring twelve of my favorite tables – one for every month of the year! 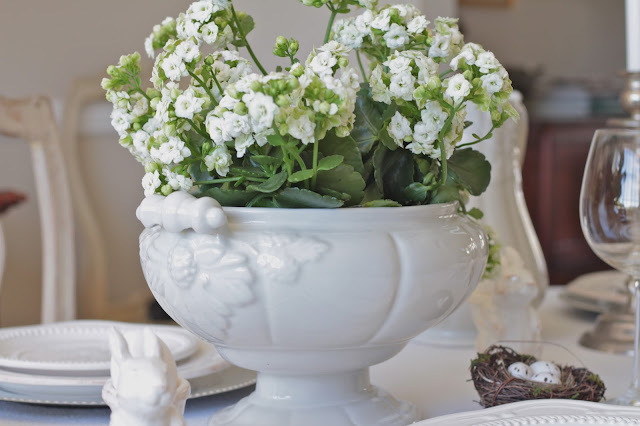 For my centerpiece I simply put a white kalanchoe plant in one of my vintage ironstone tureens. I find the best prices for these is on Etsy! 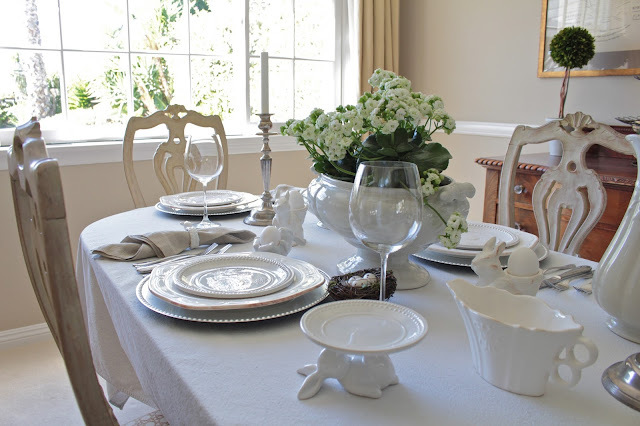 Each place setting is layered with a silver charger from Pottery Barn, white dinner plates from Horchow, and the white embossed bunny salad plates. 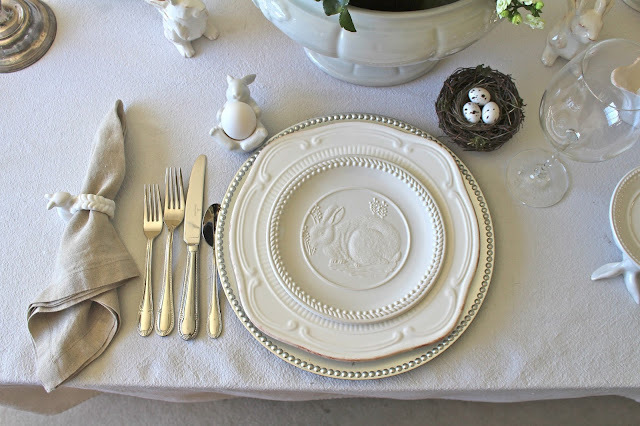 Napkin is the natural linen from Sur la Table, and the little bunny napkin ring is from Pottery Barn. 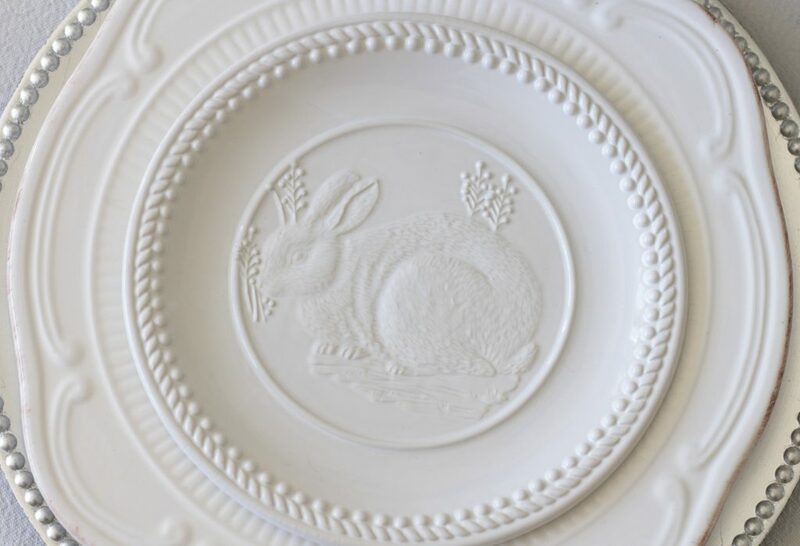 These white embossed bunny plates were quite the find at Home Goods! They seem to be a knock off of a Pottery Barn plate from a few years ago that I had fallen in love with. I had looked and looked for them the year they came out, and even searched on Ebay afterwards and I never could find them. So let me tell you, these could not hop into my cart fast enough! 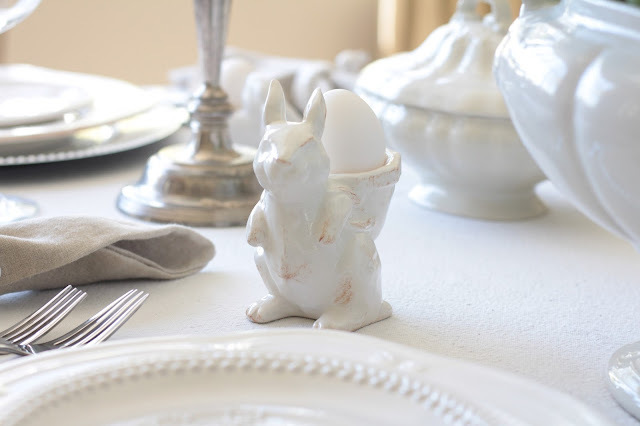 The little bunny egg cup is from Pottery Barn. There are different ones this year, but they are possibly even cuter! This particular nest was made for me by a friend. However, I have quite a few different versions which I’ve found at TJ Maxx, Home Goods and World Market. I love decorating with them for spring and I put them everywhere! The cupcake holder and other egg cups were also Pottery Barn. Other serving pieces are mostly vintage ironstone. Be sure to sign up for my emails and download my free e-book, A Calendar of Tablescapes! I’ve included sources and details for twelve tables, as well as lots of tips and tricks! 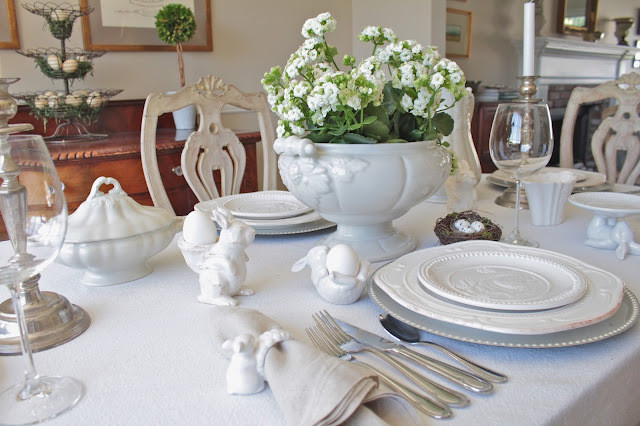 This Easter table looks very beautiful. Thank you very much for sharing these photos here. My cousin had an Easter themed wedding at wedding venues NYC. Her wedding decorations were very creative. It was a pure DIY wedding. Outstanding blog! I love your adorable table setting. Thanks for sharing these astonishing Vermeil Sets. 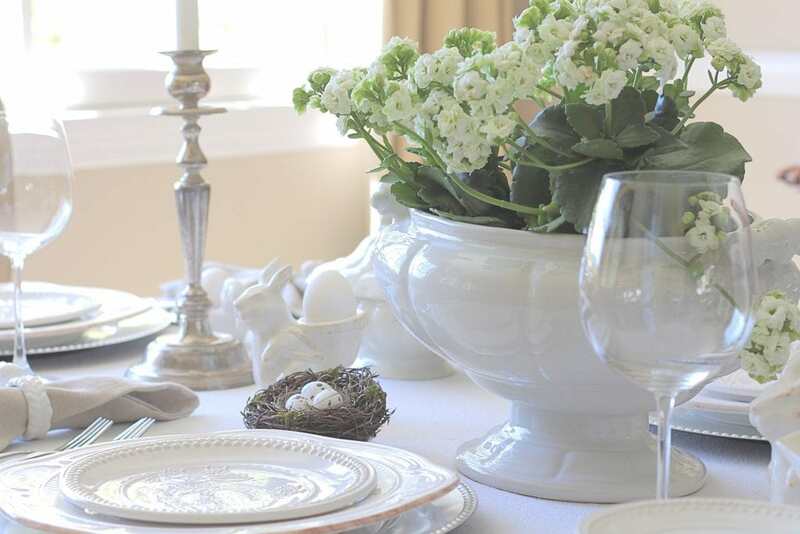 It adds the perfect touch of sophistication to your table’s cape. 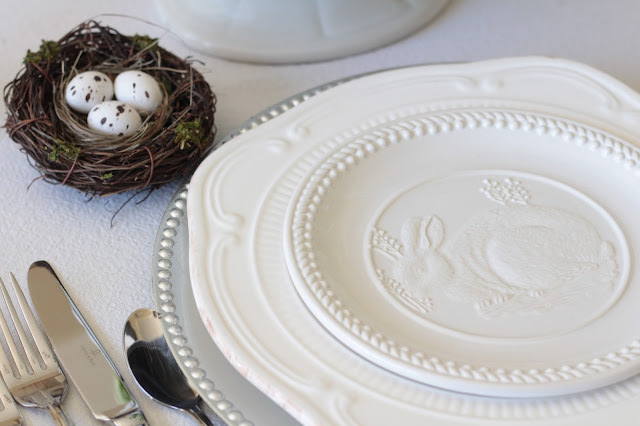 It creates elegant addition to any dinnerware pattern. 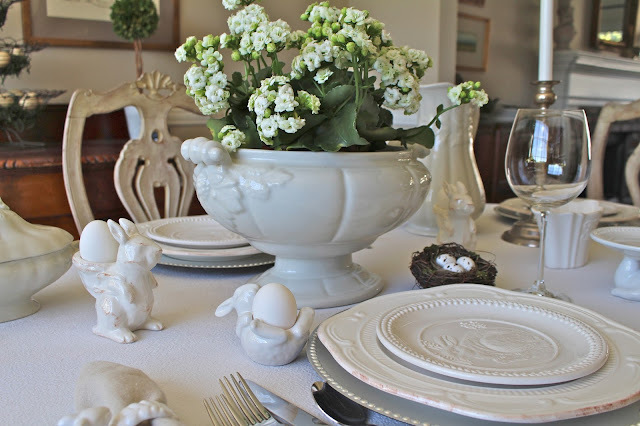 Your Easter tablescape is beautiful. All of the little details and patterns are elegant. I'm highlighting your post on my blog. Thank you for joining us at Thursday Favorite Things Blog Hop. Just love this beautiful neutral table. I love white anything but especially dishware. This looks so fresh and pretty. Love this – and it's so your style! I didn't Lisa, a friend made them actually. This is a lovely table. 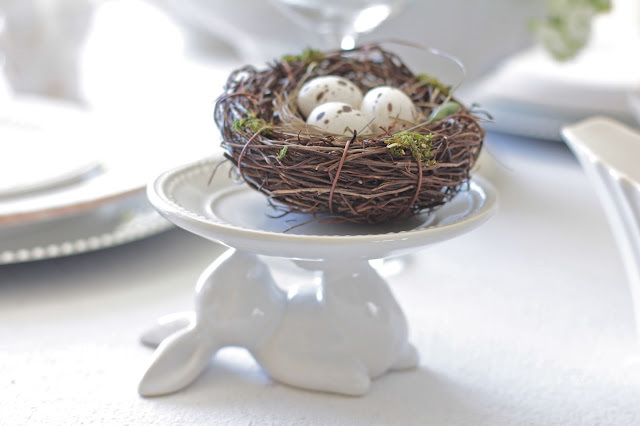 Under your credits at the end of the post, you mention that the nests are handmade. Did you make them?